Ever wanted to get more out of your lottery experience? Jackpot.com might just be the site for you. Here you can buy shares in syndicates for UK lotteries, meaning you maximise your chances of winning. Simply select how many shares in the syndicate you want to buy then wait to see if your results come in! It’s a smart way to increase the chances of your numbers coming up and it’s available on all UK jackpots. As if that wasn’t enough, you can bet on the outcome of some of the world’s most prestigious lotteries here, meaning you can effectively enter the Irish Lotto, Oz Powerball, EuroJackpot and many more. This means you won’t be twiddling your thumbs between draws — there’s always an international lottery to get your teeth into. For even more entertainment, you'll find a number of Scratchcards you can play as often as you want. How do I use my Jackpot.com discount code? Check out Jackpot.com’s Facebook page to hear about deals and competitions. How can I pay at Jackpot.com? You can pay with Visa, Mastercard, Neteller, Skrill, WebMoney, iDeal and Sofort. What responsible gambling initiatives does Jackpot.com have? You can set up a maximum daily spend limit and temporarily suspend your account. More information is available here. Does Jackpot.com have a deals page? Yes, you can find all sorts of promotions here. 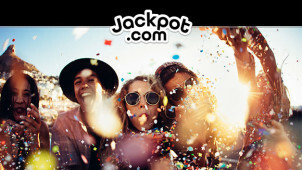 If you’re anything like us, you’ll love having a flutter on the lottery, so check out Jackpot.com for a number of different ways to enhance your experience. With a range of international games to bet on and syndicates for UK draws too, you’ve got it all to play for and using a Jackpot.com discount code from vouchercloud means you could be getting even more for your money. Good luck! Lotteries have a fascinating history and can be dated back to the Western Han Dynasty in Ancient China, when proceeds of this early form of Keno were partly used to fund the Great Wall. The Ancient Romans got involved too and it was in the Middle Ages that the Belgians and Dutch instated lotteries to raise funds, even giving us the word ‘lottery’ from the Dutch word ‘lot’ meaning ‘fate’. Carry on this tradition at Jackpot.com!